In each volume, an introductory essay outlines of history of the disciplines under discussion, and describes how changes and innovations in these disciplines have affected our lives. The biographies that follow are organized in an A-Z format: each biography is divided into a "life" section describing the individual's life and influences and a "legacy" section summarizing the impact of that individual's work throughout history. These biographies cover a diverse group of men and women from around the globe and throughout history. 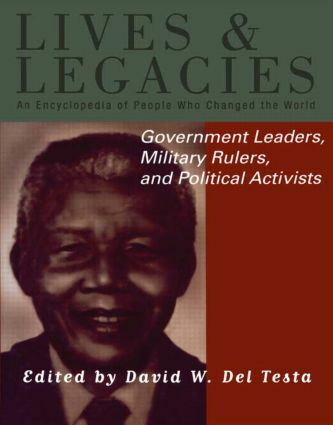 Franklin Delano Roosevelt, Mao Tse-tung and Genghis Khan are among the 200 well-known historical figures included in this volume. Examples of other lesser-known, yet important, individuals covered in this work are: Gustavas Adolphus, Swedish empire creator; Hatshepsut, queen of ancient Egyptian dynasty; and Jean Jaurès, French socialist leader and pacifist. Each synopsis provides information on each individual's enduring impact on the common understanding of fundamental themes of human existence.